The government did not identify  the entities in question, but four of the journalists arrested work with media outlets affiliated with Hamas, the political rival of the ruling party in the West Bank, Fatah. 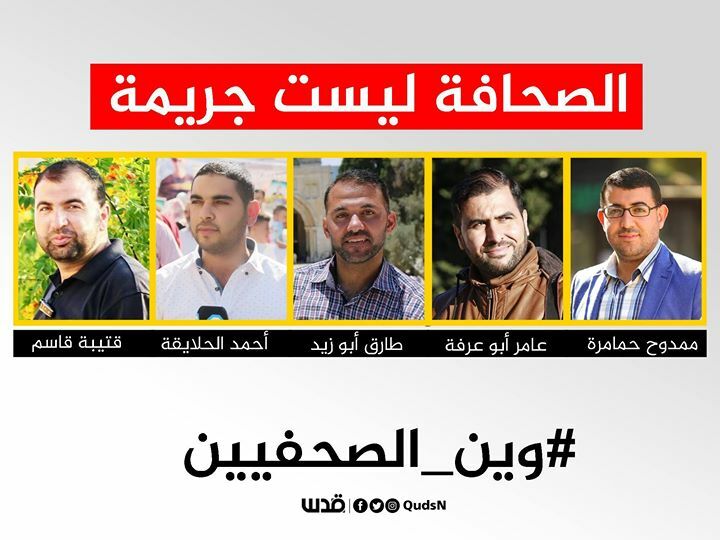 On the evening of 8 August, agents from the Palestinian Intelligence Service arrested  the five journalists from various cities in the West Bank. The security forces raided their homes  and places of work, and confiscated their phones and laptops. Their arrests come just weeks after President Mahmoud Abbas signed  a highly controversial cybercrime law that stifles Palestinians’ freedom of expression online by criminalizing speech deemed harmful to “social harmony”, “state security” and “public order”. While the Public Prosecutor’s office denied at first  any link between the new law and the arrest campaign, it later referred  to Article 20 of the law as the justification for the journalists’ arrests. The Reconciliation Court issued orders  to keep the journalists in detention for a number of days, but they were then released instead on bail on 15 August with no indictment. Relatives of the journalists believe the arrests were a politically motivated retaliation for the June 8 arrest  of journalist Fouad Jaradeh, a reporter for the PA's official broadcast TV, who was arrested in Gaza by Hamas officers. The clamp down on journalists has caused an uproar among other Palestinian journalists and activists who have launched a campaign on social media platforms under the Arabic-language hashtasg #وين_الصحفيين  ( ‘where are the journalists’) and #الصحافة_ليست_جريمة  (‘Journalism is not a crime’), to demand the immediate release of the journalists, and denounce the PA's use of the cybercrime law to repress media freedom. Holding signs that read “journalism is not a crime”, families of the arrested journalists as well as other activists and journalists protested in Ramallah  on 12 August against the PA’s rising repression of media and public freedoms and its passing of the new cybercrime law.